We wrapped up the 3rd Annual Circus Week in January 2016. We had some fantastic shows and workshops. 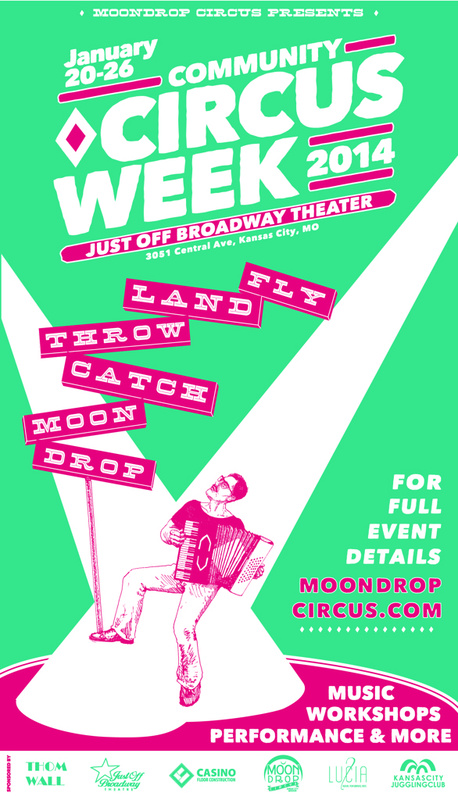 Community Circus Week is a chance for MoonDrop Circus to present an original Circus Theatre Show and share circus arts with the community. The latest show was directed by Benjamin Domask and named "Behind the Curtain." The most popular events of the week long circus festival were the Community Showcases, where we invite the public to sign up to perform any circus act they choose. We presented two showcases in 2016, that were emceed by yoyo world champion, Blake Freeman, and professional clowns, The Jester Rejects. In addition to the 4 showings of Behind the Curtain and our 2 Community Showcases, KC Cabaret produced 2 nights of Later Night Variety Shows.